As a dynamic combination of four first-rate Steinway D grand pianos of varying vintage, Blue Grand gives musicians of all skill levels more freedom to create beautiful music and unmatched artistry all of their own. After all, all pianos sound distinctly different, as is also the case, clearly, with this cuttingedge hybrid virtual instrument’s featured four: Vintage 1927 offers a rich, luxurious sound with a dynamic range suited to accompanying all music genres, including classical, jazz, pop, and more; Grandma Dream is characterised by mellow bass and expansive resonance, embracing its Germanic heritage while flawlessly fitting a variety of musical genres; Living Stereo perfectly blends crisp, rich tones and stunning resonance to provide users with a live, vibrant feel that is a perfect fit for realtime performance; thanks to its balanced frequency and singing tone, Legacy Blue boasts an elegant sound associated with a Steinway grand piano, yet its inherent versatility works well with a wide range of today’s most popular music genres. Get this, though: thanks to the trailblazing technology that The Best Computer Music And Acoustic Technology Inc incorporates into its virtual instruments, Blue Grand is, in essence, an instrument with a musical soul rather than a machine-like feel — an admirable attribute that sets it apart from an abundance of solely sample-based virtual instruments out there that it could conceivably be pitched against. As such, textually making an appearance on a GUI (Graphical User Interface) that is as easy on the eye as it is to use — albeit actions always speak louder than words, the new Neo Piano engine powering Blue Grand really represents the pinnacle of sound sampling since it lets users effectively express more than 1.6-million sounds on a single note — numerically speaking, this achieves 400 times more variations than a ‘traditional’ sample engine! Every note played is unique, creating vivid sound representation by striking a rich, accurate tone — even with minimal movement. Musically, then, through using hybrid modelling technology, The Best Computer Music And Acoustic Technology Inc has succeeded in creating a unique experience — exploited to the full with Blue Grand — that allows its users to reap the benefits of authentic sampled sounds combined with the playability of a modelled piano, providing for more freedom of expression and potential possibilities to create their own unique sound. Central to this, that new Neo Piano engine elevates proceedings, purportedly by being the industry’s first large-scale application of AI (artificial intelligence) in its software developing phase. Put it this way: while it is common knowledge that recording, editing, processing, and organising such huge sample data pools can collectively take teams of expert engineers years to complete, conversely AI can conceivably reduce this titanic task to a matter of hours, meaning musicians get their hands on better products much more quickly while also benefitting from financially reduced rates. Returning to the wonderful world of Blue Grand, each of its four first-rate Steinway grand pianos benefit from The Best Computer Music And Acoustic Technology Inc’s innovative HD Velocity Layers technology, transporting performers’ (potential) adeptness above and beyond what was previously possible. Indeed, its creators have broken the barrier of 127 layers for MIDI (Musical Instrument Digital Interface) by expanding expression up to 65,536 velocity layers (when 1,000 layers yielded an already audible difference)! Duly delivering yet another breakthrough, the new Neo Piano engine powering Blue Grand generates Multi-Dimensional Resonance. Reality dictates that every grand piano’s sizeable soundboard reflects sound that resonates in conjunction with the wooden body of the instrument itself. Indeed, it is this continuous process that makes every note played sound so unique. Ultimately, in order to simulate this behaviour, The Best Computer Music And Acoustic Technology Inc captured multi-angled IRs (Impulse Responses) from the soundboard, then used modelling technology to convert those IRs into Multi-Dimensional Resonance algorithms. The result? An amazingly true to life concert hall sound readily available at anyone’s fingertips! 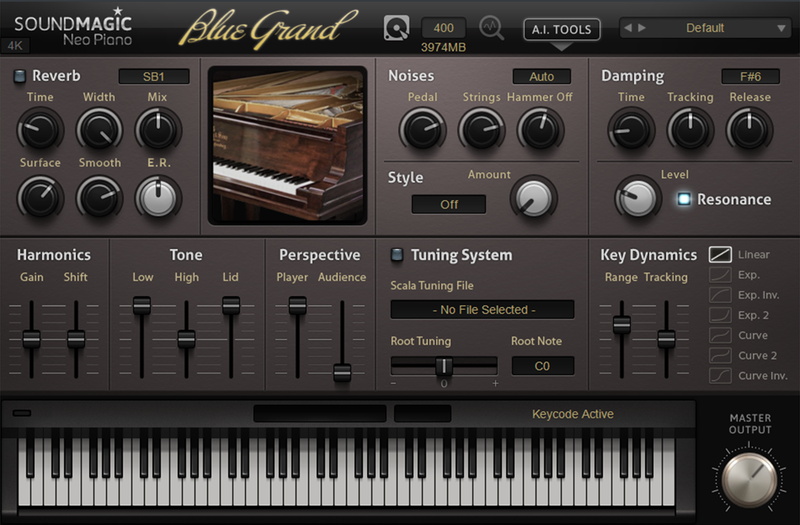 Furthermore, that beautifully-implemented Blue Grand GUI gives users unmitigated control over 40 piano attributes, including an ability to lift the lid, tweak Tone and Harmonics, alter Damping, change Key Dynamics, and adjust velocity response. Ultimately, users can even apply a Style — sets the piano in question’s musical style, be it classical, jazz, rock, or soft, and changes the internal parametric EQ accordingly via a simple Amount control — or sympathetic Resonance to their sound, and adjust the mix by changing microphone Perspective. Pushing onwards and upwards, further features of note include a DFD (Direct From Disk)/RAM (Random Access Memory) system — enables users to allocate resources to ensure the best possible performance for any given project; Tuning System — allows users to select a Scala Tuning File from over 10,000 tunings; selectable Reverb — replete with several self-explanatory settings; and adjustable physical piano Noises — Pedal, Strings, and Hammer Off par excellence. Ending on a high note, A.I. TOOLS take care of checking the response of any Blue Grand user’s keyboard playing and pedal usage automatically, almost instantly locating and applying an appropriate velocity curve to suit at all times. Truly offering expressive state-of-the-art sound and dynamic performance, Blue Grand gives musical meaning to the trailblazing technology that its aptly-named creators collectively applied to creating a first-rate hybrid virtual instrument — one that quite literally lives up to The Best Computer Music And Acoustic Technology Inc name!